A new puzzle game based on the NES classic Wrecking Crew. Bowser has built skyscrapers all over the Mushroom Kingdom. Mario sets out to take them down. Challenge each of the enemy characters in the story mode. 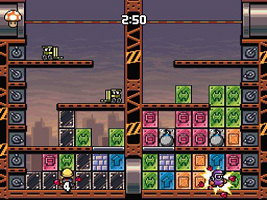 Portions of wall drop from above and you have to break them or move them along conveyor belts. If the blocks reach the top of the screen then you lose. Destroy matching walls to drop unbreakable iron walls on your opponent. You can also play the full NES version of Wrecking Crew.